Open Country celebrated the launch of its brand new wheelchair accessible minibus. Members of the charity gathered together with staff, volunteers, trustees and funders to celebrate the arrival of the new minibus. Russ Piper, Chief Executive of Sovereign Health Care, who gave a £7,188 grant towards the new minibus, was invited to cut the ribbon on the new wheels. 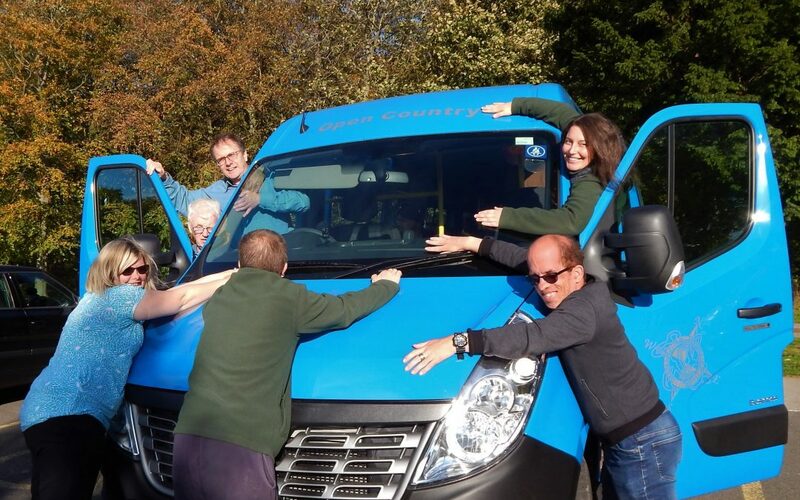 The new bus, nicknamed ‘Blue Calypso’ by the charity’s Advisory Group, will be used to transport members and volunteers across the county to take part in walking, cycling, conservation and adventure activities. The bus has been dedicated to the memory of Roy Bousfield who was a Trustee and benefactor of Open Country. Golden Glory for the Open Country Allotment! There’s no such thing as bad weather… only unsuitable clothing!